Stacy Tilton Reviews: Power up on the go! Power up on the go! We recently went on vacation to see my husbands parents in New Hampshire and to enjoy a little time away as a family. And that meant lots of pictures being taken by everyone on their cell phones. You know it's the digital age and hardly anyone uses an actual camera anymore. Heck I even took my camera with me on the trip and only got it out one time. It's just so much easier to pull my phone out of my pocket and snap a photo vs. trying to lug around a camera around my neck all day in case I see something I want to take a picture of. Of course all that photo taking does a number on one's phone battery. And if you're out and about all day long like we were some days that means no where to plug it in for a recharge. Thankfully though I had a back-up plan in my purse from myCharge. It was a Hub Series Charger with built-in charging cables. And oh man did it come in handy. Anytime someone's battery dropped below 50% we just plugged it in and charged it back up so no one had to worry about not being able to use their phones. It was so convenient and super easy to use since I didn't have to remember to carry a phone charging cable with me. And to top it off it even has built-in wall prongs for charging the hub back up. Another great feature leaving me without having to remember yet another cord for charging. All of the portable chargers I've ever had before I had to have a cable for charging the unit as well as one to plug into my phone for charging it. I'm sure you're familiar with those and how much of a hassle they can be. 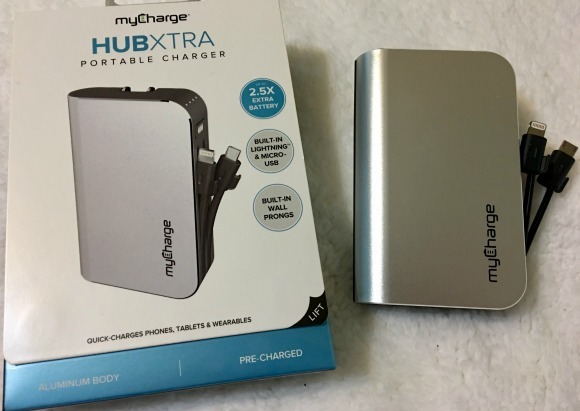 With a Hub Series Charger from myCharge you no longer have to worry about cables at all! Hub Series Chargers include built-in wall charger prongs, a micro-USB cable, and lightening cable for charging devices. Ooooh, I really like this. I may have to add it to my cart!